After spending most of his youth in Vermont, Rix chose San Francisco as the site of his apprenticeship to a trading firm. However, most important for his subsequent career, he worked in a paint store where he made signs and did decorative work; he also studied briefly with two local well-known landscape artists. In 1876 he was one of several artists who moved to Monterey to start an art colony. A scant four years later, however, Northern California’s depressed art market forced his return to the East Coast. 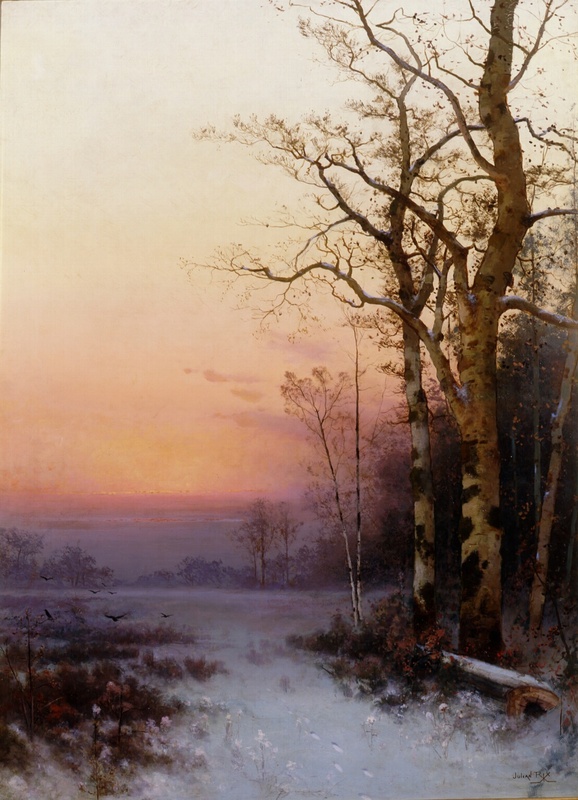 Untitled (Winter Twilight) was painted c. 1880. Rix rarely painted specific landscape spots but preferred idealized compositions of trees and water, often giving them generic titles in the Barbizon mode such as “Sunset” or “A Sleepy Glade”. Unlike most artists, he often chose a vertical format, as here, placing a stand of trees to the right and centering the work with a water feature – in this case a patch of snow. This work’s hazy sunset glow exposes the interest that late nineteenth century artists had in casting a tonal glow over their subjectively interpreted landscapes.